On virtual paper, Glasi Hergiswil looks amazing: a high-tech museum that explains the global history of glass-making and the local factory’s role, viewing access to a searingly-hot glass-making workshop, examples of glass containers from all periods, a science museum that allows the user to interact with glass in its different forms, a multi-coloured labyrinth of mirrors, and a playground with a huge fibreglass dragon and two-storey marble run (with a handy, coin-operated marble dispenser nearby). 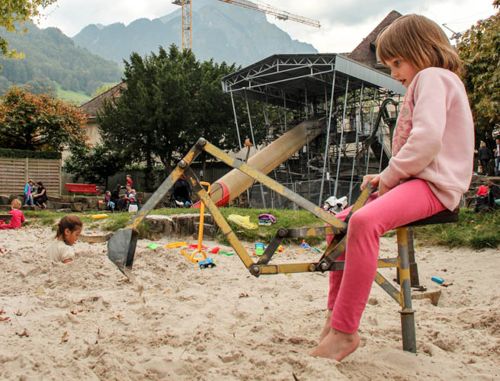 There’s an opportunity to try glass-blowing in the factory, and oh — children under 10 are free with the adult fare being a modest 5 Swiss francs. Each aspect of Glasi Hergiswil was equally amazing and fun. Our tour through the museum was in English, with interactive exhibits that lit up or animiatronic effects designed to keep our attention. I liked the way all the surrounding exhibits would remain dark, and we would follow the lights or the automatically-opening doors to continue the tour. The tour leads into a generous viewing deck above the working furnaces of the glass factory. As we watched the workers turning molten glass into baubles, we could feel the heat and grow in new appreciation for the glass objects we usually take for granted. One worker is rostered in a glass-blowing station attached to the workshop. 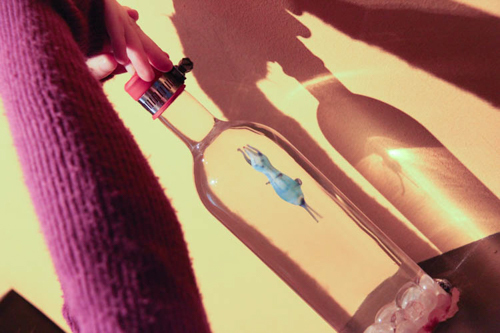 Visitors can pay to blow into the pipe and inflate a blob of liquid glass into a sphere. Once we watched it being done, Brioni was the only one keen to try it out. We examine the globe that Brioni made. The factory is very careful to let us know that they can't guarantee the lifetime of this sphere because it hasn't been cooled down properly and could shatter at any time. Attached to the factory is a collection of glass containers from different parts of the world. It’s fascinating to see how the quality and shape has been affected by the culture in which it is fashioned. A German-only video explained some more about glass, but we were were happy just to pick our favourites out of the bottles on display. The interactive exhibits within the Phenomenal Glass museum added another dimension to what we had learned about the production of glass in the factory. Instead of just looking at decorative glass, we were shown practical examples of glass in construction and technology. From wine-glasses set up to be set ringing to a reinforced glass panel that we were invited to jump upon, this part of Glasi Hergiswil kept us busy for almost an hour. The interactive exhibits within the Phenomenal Glass museum give us a chance to play with what is usually considered fragile material. The girls enjoyed the glass labyrinth so much that we paid for a second admission. Actually, we only had to pay for me — the girls were admitted for free. Prior to entering the dark room, we had to don slippers over our shoes or socks (for children too small for slippers), plus white cotton gloves. 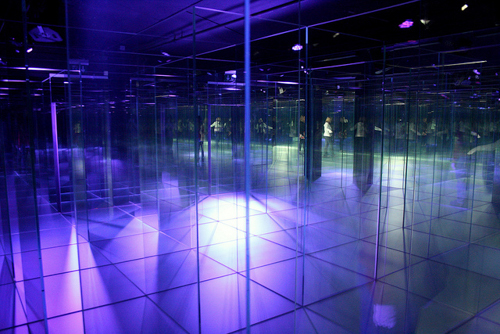 Once inside, coloured strobe lights flashed on and off, lighting our way through the mirrors and glass. The attendant recommended we only step forward with a hand out in front of us, but despite this, we all hit our foreheads a time or two as we misjudged whether we were stepping into a wall or a space! Once in the maze, it's fun to split up and then see how quickly you can reunite again. The lights above keep changing colours and effects, making navigation more difficult. Glass maze © Matthew Perkins, shared under Creative Commons license. 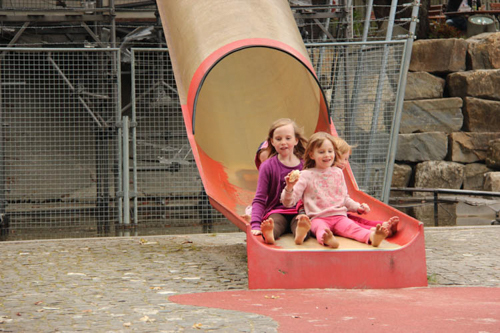 Outside the buildings, a public-access park attracts locals with its huge fibreglass dragon and a playground sprouting an extra-tall slide and integrated marble-run. Hergiswil sits on the western shores of Lake Lucerne, and I couldn’t get over the extraordinary beauty of the location. We'd been learning how sand is used in making glass, and so of course, the first thing Calista says when she hits the sand-pit is, "I'm going to make glass with this!" It's a slide big enough to fit all four of the girls at once! All around the slide is an intricate maze of pipes, glass tongues and funnels that act as a marble-run. I like the way the rough-cut rock walls formed the stair-steps back to the top of the slide. Fountains on the lake are interactive. With this one, the user turns the controls to manipulate the direction and force of the water. In reality, Glasiweg certainly met all our expectations and more! We spent all day here and only left after closing time, and once the rain chased us away from the playground. If we could return to a specific destination in Europe, this one would be high on the list. 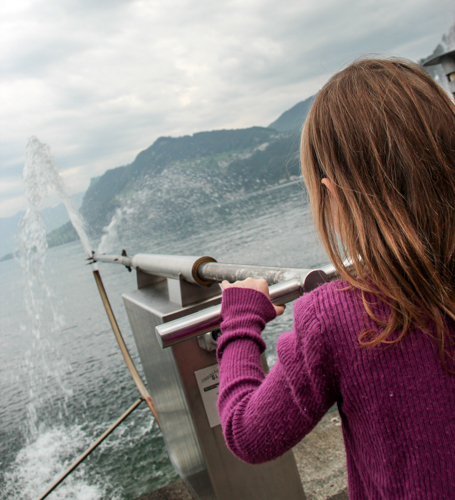 Don’t visit Switzerland with children without making this destination a priority! I am so glad you and the girls enjoyed the glasi. It is still one of our favorite days out, and we always take visitors there. 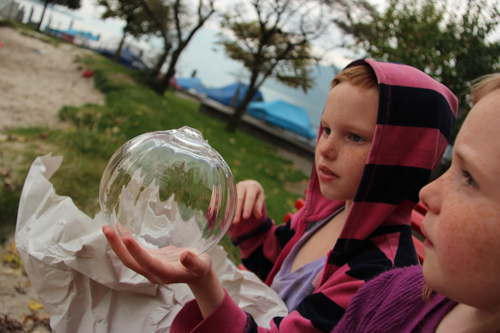 It is interesting that their initial reaction – a glass museum with kids?? – is always surprise, but everyone we visit with comes away having loved the experience. Well done for finding and properly exploring one of the lesser know gems of Switzerland! My dad arrived today in his new motor home, I have never seen him so happy and stress free…you guys are on to something! It’s so lovely to read your adventures again.